Has anyone ever taken a Bleacher Creatures doll into a tattoo parlor, intent on recreating a player's actual tattoos? I have no idea how much a tattoo costs, but considering most NBA players have, on average, 87 tattoos, I would imagine it would cause uncontrollable salivation for a parlor owner. Here are five NBA Bleacher Creature dolls, all of whom are participating in the 2016 NBA playoffs. LeBron James was still with the Miami Heat when Bleacher Creatures first started making dolls in 2011, and between the Heat uniforms and various Cleveland Cavaliers uniforms, I'm not sure whether James has more Bleacher Creatures or more losses in the NBA Finals. Regardless, this is my favorite of the LeBron dolls, as he is modeling the Cavs' maroon and gold uniform. Interestingly, Bleacher Creatures has yet to make a LeBron doll without a headband. While Bleacher Creatures usually reserves plush treatment for star athletes, Dennis Schroder proves that a random blond spot of hair is enough to convince a company to mass produce a toy of a player who comes off the bench and averages 11 points. This would probably be my strategy if I played in the NBA. The German point guard is featured in the Atlanta Hawks home white uniform. The Oklahoma City Thunder may not have stylish uniforms or a sharp logo, but their mascot, Rumble, is pure class. Rumble is wearing the Thunder home white ensemble. There aren't many scenarios more frightening to imagine than seeing an approaching buffalo walking on its hind legs, but this plush version of Rumble is perpetually waiting to hug his owner after a hard day at work. I would like to see a shooting contest between the real Klay Thompson and the plush Klay Thompson. 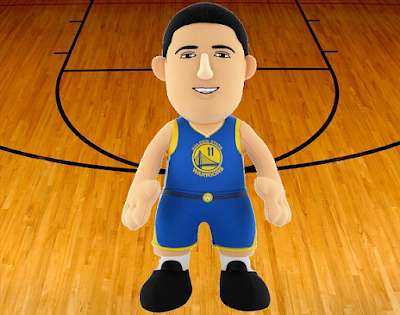 Bleacher Creatures has made multiple toys of Klay, but this version has him wearing the Golden State Warriors road blue uniform. However, all the plush Klays have only four fingers on each hand. Would this hurt or help plush Klay's shooting percentage? And is plush Klay a better shooter than plush Stephen Curry? Last but not least, the 2016 Defensive Player of the Year, Kawhi Leonard, is represented in plush form in the San Antonio Spurs road black uniform. This may be the most realistic of all the dolls Bleacher Creatures has made. The real Kawhi does not talk much, and neither does this doll. All of these Bleacher Creatures are around 10 inches tall and are available online for $19.99 retail price.